Advance Acoustics X-i50BT High-End audiophile stereo hifi amplifier X-i50BT, 2 x 50 W on 8 Ohms..
Dynavox CS-PA1 Mini ενισχυτής 2 Χ 50Watt max σε ασημί χρώμα. Ιδανικό για ταυτόχρονη σύνδεση ήχου τ..
Advance Acoustics X-i 1000 High-end stereo Hifi amplifier 2x220 RMS w on 8 Ω and switchable in ..
Advance Acoustics X-i 125 Audiophile stereo Hifi amplifier, 2x125 W RMS w on 8 Ω, DAC Digital a..
AMR AM 77 Amplifier Dual Mono Amplifier ΑΜ 77 Solid-state amplificat..
Anthem Integrated 225 Amp 2Ch Hi Fi Amp Pure. Purer. Purist. Love..
Arcam FMJ SR250 Receiver 2-channel high-end audiophile AVR, 4k (UHD) HDMI 2.0a with HDCP 2..
Arcam HDA SA10 Integrated Amplifier Integrated Amplifier The design o..
Arcam HDA SA20 Integrated Amplifier Integrated Amplifier Class.. 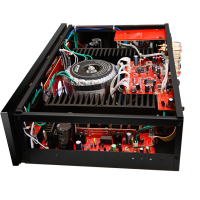 The IN100se’s high-capacity power supply reproduces all the energy of the original live perfor..